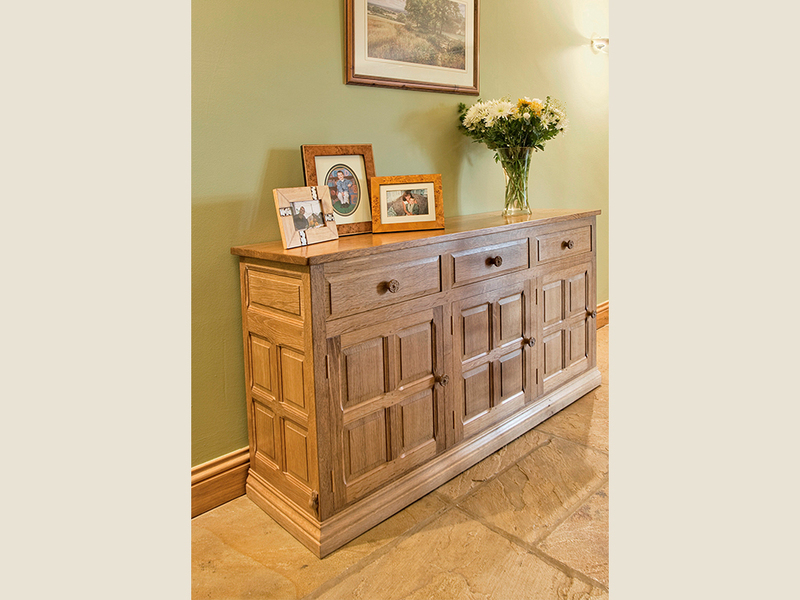 Sideboard in "medium" fume English oak. Shown here on a plinth with carved "rose" door knobs and 4 panels in the cupboard doors with matching panel arrangement at each end. The height and depth of the cupboard shelves may be specified. Our carved "Beaver" trademark can be found on the side of the front upright. The sideboard top has a planed finish and has been treated with polyurethane lacquer to provide protection against heat and spills but may be oiled or waxed. We recommend an all over lacquer for kitchen use. The sideboard can be custom-made to size and is also available on feet, or with turned button door knobs. Wrought iron and other styles of door furniture or an adzed finish to the sideboard top can be requested as optional extras. If this design isn't what you had in mind please get in touch we will be happy to discuss your ideas with you.